'Champagne Hillsides, Houses and Cellars' is a cultural landscape shaped by the production of sparkling wines since the 17th century. Champagne Hillsides, Houses and Cellars is another candidate for inclusion this year. And it's another serial nomination: it comprises 14 locations in the Champagne-Ardenne region in the North East of France. On my way to the WHS of Vézélay and the Abbey of Fontenay, I spent Ascension Thursday in Reims to check out a couple of these Champagne sites. I rarely drink alcohol, so all these wine-related (T)WHS are a particular chore for me to tick off. Fortunately this nomination focuses more on the industrial and commercial process of champagne production than on endless hillside vineyards. With this cleverly chosen angle of argumentation, I believe the Champagne sites also distinguish themselves enough to warrant WH status. The sites are presented as a continuing evolved cultural landscape too, which for sure must please some of the jurors. And to top it off, these sites (or at least their products) are globally known: "The outstanding nature of Champagne also lies in its symbolic aspect, shared across the world". 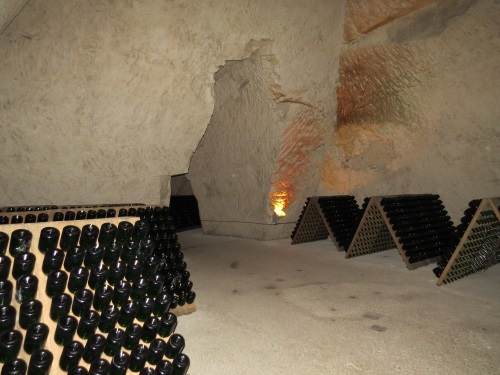 Among the special features of this WHS are the Cellars: underground chalk chambers that hold the bottles of champagne until the contents are ready to be consumed. 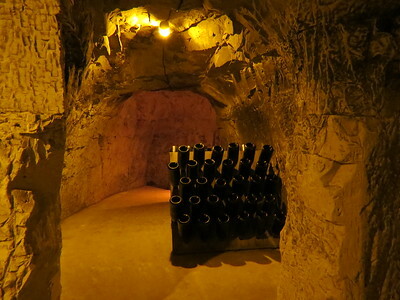 You can visit the cellars on a tour of one of the Champagne Houses. They all seem to do tours, as a form of publicity or way to earn something extra. 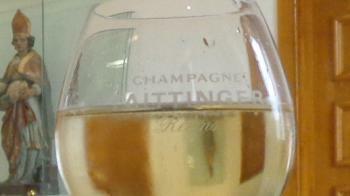 I choose to visit Taittinger in the champagne quarter of Reims. This is the only one of the major houses that offers tours without prebooking. I arrived around 11 a.m., and was able to directly join a tour in English. There were about 25 other participants from all over the globe, so these tours seem to be quite popular. Cost was 16.5 EUR including one glass of champagne. The Taittinger cellars are located on the site of the basement of the old Saint-Nicaise abbey and in former chalk quarries. The tour both shows the remains of the abbey and the champagne production process. Endless rows of champagne bottles line the 4km long hallways: they stay there for up to 8 years until the delicate process is finished. There are two fermentation stages, and the characteristic cork is only added at the end. The temperature in the chalk chambers is a constant 12 degrees Celsius. 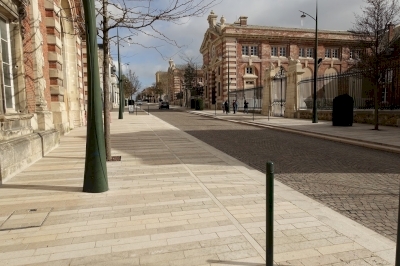 Another subsite in Reims that is part of the nomination is Saint-Nicaise Hill. This is an area with large public spaces and parks, dotted with industrial buildings that belong to the champagne production process. There even is a 'Champagne Park' - a vast public park where locals go for a picknick or a run. It was created as an area for employees of the Pommery Champagne House to practice sport. The buildings, according to the nomination dossier, "also play a representative role, helping to win over clients". Also, "a number of patrician residences occupied by the heads of the Champagne Houses" can be found here. The most striking of the former is the seat of Vranken Pommery, a complex that oozes luxury and quirkiness. You can walk the grounds freely, and amaze yourself at for example the flashy blue pine trees in the front garden. The popularity of the drink owes a lot to the marketing strategy of the Champagne Houses, which since the late 19th century promoted the wine's image as something worthy for royals and as such to be aspired by the middle classes. It seems that the marketing has worked magic again on the ICOMOS and UNESCO committee members. Twenty or so years back my aunt and I had visited Reims. We had been to the cathedral and visited the city center. But we skipped on the hills where the Champagne houses are; it's not in walking distance from downtown and at the time it wasn't a tourist attraction. This time we skipped past the city center and went directly up the hill. It's really impressive when you pull in. 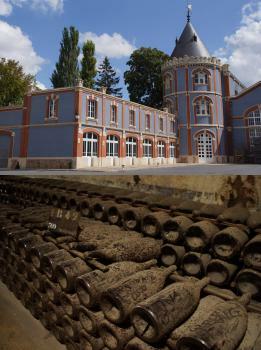 The Champagne houses are large estates, half factory, half palace. It's interesting how the marketing influenced the architecture and the presentation. When you visit the Pommery cellars for instance, you will see plenty of art on exhibition. While this may seem like a fancy tick, this is part of the original marketing conceived by Ms Pommery back in the 19th century. In Reims we managed to see the Pommery Cellar and the St Nicaise hill. We passed by Taittinger and Martel but both houses were closed on Sundays. In Epernay we visited Fort Chabrol and the stellar Avenue de Champagne. If I had to pick between Reims and Epernay I would probably opt for Epernay as you are closer to the vineyards. In Reims I was really wondering if there is wine at all in the Champagne. Overall, this is a pretty great site for a wine site. The 19th century architecture really sets it apart from other vineyards. There are TGV trains to Champagne Ardeche on the outskirts of Reims connecting you to Paris, Strasbourg, Nancy and Brussels. To get to Epernay you are better served taking the direct local train from Paris. I wanted to see one of the champagne cellars. Most cellars are only open during the week. The safest bet seems to be Pommery where they run frequent tours even on Sundays. The tours costs 23€ and includes a glass of Champagne. I did not reserve and this was not necessary in March. In Epernay there was only one smaller House open. I am not sure if they offered tours. Reims is itself a WHS. From the hills where the Champagne cellars are you have a great view of the cathedral. The WHS also has a location within walking distance: the Abbey of St Remy. It is just next door to the Caves Martel. I have to admit that I really enjoyed my visit to the Abbey and would encourage you to stop by. In Chalons-en-Champage there are two components of the French Camino. The whole area of Northern France is dotted with World War I Memorials (T). Visited Pommery champagne house in August 2018. It should be pre-booked in advance through the official web site http://pommery.tickeasy.com/Accueil.aspx. The guide told fascinating story of the house, Madam Pommery and champagne making process. 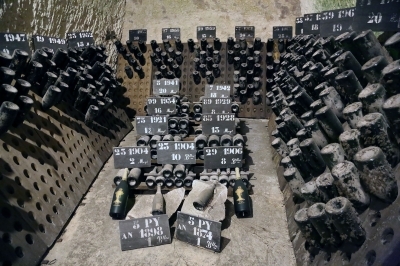 One of the cellar rooms contains the most prominent bottles, including a bottle of the first original brut created in 1874 (only one of two perfect vintage years, when no additional sugar is needed). 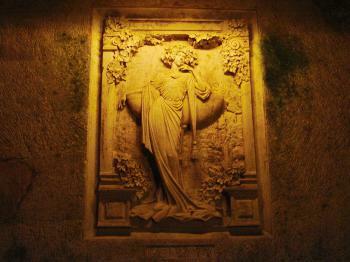 There is also artwork inside the cellars – large sculptures completed in 1884 by Gustave Navlet. Currently the cellars a part of large Vranken Pommery Monopole Group with sales of 300 million euro and 800 employees. Champagne testing followed the tour and it is amazing. In overall, good experience and interesting truly unique region. In the morning before the flight from Paris back to Berlin I decided to visit the Taittinger Cellar of the Champagne WHS so that I can finish off this part of France. After some scuffle with the French police at the Gare de Paris-Est (while I was using a toilet on TGV, 2 men stole my wheeled bag from the luggage rack only to be arrested once they got off the train with my bag, all before the departure), I arrived at the Cellar in Reims in time for my English tour. The tour was fine, and the glass of Champagne to cap the tour was even finer. I believe the color of their product, shown in the photo, speaks for the OUV of this WHS. But I regretted that this trip to Reims was so hastily organized that I didn't manage my time in Reims well and couldn't even view the phantasmagorical Pommery Champagne house. I did manage, however, to squeeze in a visit to the St. Remi Abbey, another WHS, near the Taittinger Cellar. The Champagne WHS consists of three elements: the vineyards around Hautvillers and Ay, the architecture of the Champagne houses in Epernay and on the Saint-Nicaise Hill in Reims, and the network of chalk cellars in the subsoil of these sites. We started exploring this WHS in Epernay. We left our car in a large parking lot in the town centre near the western end of the Avenue de Champagne. The Avenue de Champagne is about 1.5 kilometres long, the Champagne Houses are lined up next to each other on both sides of the street. Well, "Houses" is clearly an understatement, the terms chateaux or mansions are more applicable. Most of them were built in the 19th century. The Moet & Chandon company has the largest building and it is also the best known brand, most of the other names I had never heard before. Several of the Champagne Houses offer guided tours to the cellars, Le Castellane (easy to find because of the striking water tower) can be visited without pre-booking. Next, we headed to the villages and vineyards north of Epernay. Hautvillers is the most picturesque village and is regarded as the birthplace of Champagner. The Benedictine monk Dom Perignon was in the 17th century the cellarer of the Abbey of St Peter. He significantly contributed to the development of the Méthode champenoise, the second fermentation in bottles, and the blending of different grape varieties. And a legend says that he also introduced the bottle size of 0.7 liters, because it's the average consumption of male adults at dinner! Today a statue honours the famous monk and his grave slab can be seen in the church of the former abbey. In Ay, we went for a short hike in the hills. The vineyards were marked with white boundary stones, Moet & Chandon was the most frequent label. It was a nice hike in the lush green vineyards, the grapes were almost ripe in September. However, vineyards look more or less the same everywhere, nothing special even in the Champagne. The highlights of our visit were the cellar tours at Pommery and Taittinger in Reims. The Saint-Nicaise Hill is located at the outskirts of Reims, the area is different from Epernay, the residences and production facilities are surrounded by vineyards and parks. Pommery has a really representative headquarters. I'm still unsure whether it is fine neo-gothic architecture, or rather a corny Disney-like fairy tale castle (upper photo shows a part). In any case, it is an imposing complex and is highly representative of the product: luxurious and high quality, but also a bit overdone. The tour starts with seemingly endless stairs, more than hundred steps lead directly down to the chalk cellars. The oldest galleries originate from former quarries from the Gallo-Roman period and have been extended to a total length of 18 kilometres, only at Pommery. The galleries even have street signs and were named after big cities. The tour also leads to some of the huge "crayères", funnel-shaped caves up to 60 metres high. It was very interesting and entertaining, the history of the company and the production process were explained in detail. We saw endless rows of Champagne bottles on old wooden racks or stacked to high walls of glass, all thickly coated in dust. We also saw the treasury: selected bottles from the best vintages. Everything very traditional. Unfortunately, the modern production facilities were not part of the guided tour, that would have been very interesting as well. We paid 24 euro per person for the tour with two tastings (18 euro for one tasting). The next day we visited the Taittinger caves because they are said to be the most beautiful. However, there were no significant differences between the two, neither in content and quality of the guided tour, nor in the price. Maybe the caves (crayères) are not as high as those at Pommery, but you can see the remains of the abbey, a few steps and doors. So, one cave visit would be enough if you have no special interest in the tasting. 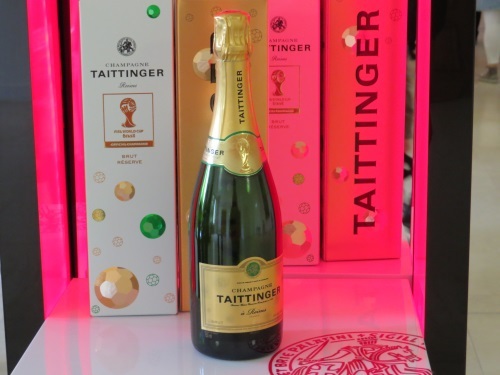 The advantage with Taittinger is that you can visit without prior reservation. But one cave tour is a must to properly visit this WHS. 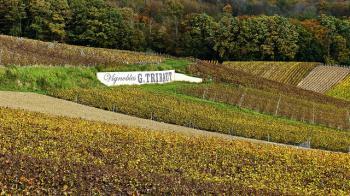 The Champagne WHS is a combination of an agricultural landscape, a traditional production procedure that is used until today, and typical architecture. Thus, I would say that the inscription in 2015 was justified, although vineyards were already well represented. And even though I prefer non-sparkling wine. The inscription of Champagne did remind me the first time when I visited the city of Reims in 2006. The main reason to visit was to see the famous Cathedral. When I reached the youth hostel, I saw a brochure of champagne cellar tour and really captured my interest. I immediately decided to walk to the champagne house area; on the way I stopped to see the World Heritage Site of former abbey of Saint Remi. After some direction confusing and old record shops browsing, I finally arrived at the front gate of the champagne house of Pommery. In 2006 the name of the house was still just Pommery and opened to public tour with no need of reservation. My first impression on the place was “is this really a champagne house!” since I saw a complex of many types of architecture from medieval castle-liked building, Gothic building with fake turrets and conical roof towers next to very neo classical building. Not only that there was a modern contemporary statues guarding the door. I was not sure that I could consider the place to be bizarre or tasteless or inspiring. Anyway I entered into this champagne house, and found the sign of ticket booth. There were three types of ticket to choose, cellar tour with one tasting, cellar tour with Grand Cuvee tasting, and just cellar tour. I could not remember the price but I remembered I chose the cellar tour with one tasting, the Grand Cuvee was a bit too expensive for me in that time. At the lobby there was a very big wooden barrel sculpture depicting another strange art! I followed the guide who only spoke French to the underground cellars which they named them, Caves Pommery. Inside the chalk caves was full with champagne and many arts displaying. I almost forgot all of the guide explanation, but still remember that there was a relief of Bacchus, the god of drinking, and each caves named after European cities like Madrid or the name of the first owner Madam Pommery. The last place before ending the tour was a lock small cave that kept very old and very expensive champagne from many legendary years of production. Then the time of champagne tasting, I was not sure that I liked the taste or not but at the end I bought a pack of four bottles of their new product champagne pop, and quickly back to the city center to buy Biscuit rose de Reims which cellar tour guide recommended to eat with the champagne. So looking back I really had a good time with champagne and Pommery! My later experiences with champagne were all happened in Epernay, and I noticed that other champagne houses are also built in grand architecture and full with art objects, so maybe it was a common characteristic of champagne house to have image of luxury or art patron, that sometime too much and tend to be too bizarre, but again no place can compete of bizarreness of Pommery House, in my opinion. For World Heritage Site inscription, I really agreed with ICOMOS, and considered that Champagne nomination is truly justified to be on the listed for its unique characteristic of wine culture and its way to attract customers with image of high end symbol. Not sure that the inscription may make some customers choose champagne instead of sparkling wine or not since after listed every times drinking champagne, we are drinking World Heritage drink!! Another level of appreciation! Cheers! I visited this TWHS in June 2013 unknowingly but in November 2014 I made up for it by staying at a small champagne-maker. I visited a number of chalk cellars (Veuve Cliquot, Marcier, Taittinger, etc.) with guided tours varying from 30 mins to 2hrs. My favourite cellar was Pommery's together with the Art Nouveau Villa Demouseille. I explored the famous Avenue de Champagne in Epernay and enjoyed visiting the Comtesse Lafond Castle. Finally I visited several small towns nestled in the Champagne vineyard hills such as Dizi and Hautvillers. In Hautvillers I visited the tomb of Dom Perignon and then walked through the vineyards of Moet & Chandon to a panoramic viewpoint. Hautvillers is a very quaint village, famous for its wrought iron signs. Most probably this site will be inscribed in 2015. Name in French changed to 'Coteaux, Maisons et Caves de Champagne'. Name changes: Name in French changed to 'Coteaux, Maisons et Caves de Champagne'.